She had every right to kill him. Nobody blames her. They understand that she did what she did in order to survive. She stands vindicated before the law; her innocence proven in the eyes of the public. Yet, she hasn't had a peaceful night since it happened. She stays wide-awake at night, the scenes replaying in her mind. It isn't the trauma of his violence that incites the perpetual fear in her, but the monster that she knows is living in her; the monster that stole that life away. No matter how accursed he was, how damnable, how heartless - it was still a life, a God-breathed life. "Thou shall not murder. Thou shall not murder. Thou shall not murder." The 6th commandment of the Mosaic Law is engraved in her mind, eating her soul away, eating, eating, and eating. When she awakes, for the 365th time, everything (finally) (seems to) resume its normal momentum. Life goes on; the days go on. Healing - she thinks she might recover, after all. People stop talking about the incident, stop asking if she's okay, stop shooting her with curious questions. "I might survive." She psyches herself. Genuine laughter, peaceful nights, infrequent breakdowns... "It might really be happening." Hope bubbles within her. Hope that she never should have harboured. "Sweetie, did you watch the news last night? Someone got murdered around the neighbourhood. Be careful when you're out at night. People these days are really scary..." Her mother cautions her. She is caught off-guard. Beyond her foreknowledge, beyond her comprehension, beyond her control, she feels as though she's being thrown right back into the pit - the dark, lonely, wearisome pit of guilt, shame and condemnation. She buries her head in her hands, in a feeble attempt to mask her inaudible groans; to collect the fountain of tears that are uncontrollably, against every grain of willpower, spilling out of those bloodshot eyes. 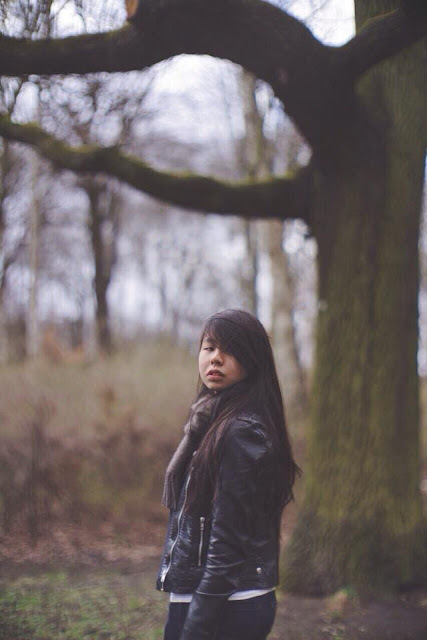 Her mother, with anxiety written all over her face, gently places her arm around her shoulder; asks her if she's okay. "No, no, no. Don't ask me if I'm okay. I AM OKAY. Can't you tell? Can't anyone tell? I'm already okay..." She pleads, in her mind. "I'm okay," is all she replies. She's not okay, and she (now) knows it full well. She had mistaken radio silence for peace. Every verdict of a murderer, guilty as charged, is a death sentence on her. Every caution of a suspected killer lurking around the neighbourhood is a warning of the monster that breeds in her. Every recollection of a vicious genocide reminds her of her blood-guiltiness. She puts on a façade in the day but in the night - every night, once again - her walls tumble down like the walls of Jericho. She cannot understand why she deserves this (mental) torture. She knows in her mind that she is guilt-free; but no matter how hard she tries, her heart tells her that she is guilty. She is guilty. She is guilty. I am guilty. If you have read my “About Me” page, you would probably have realised that I am pro-government. It was probably a risk to have made that statement in my introductory page. Fervent opposition party supporters would probably have blacklisted my blog or swore never to come by again. (Not that I’ve actually ever blogged about politics.) Yet, being the passionate person that I am, I had no qualms in professing my ardent support of the incumbent government, albeit not explaining why. Today, on the 50th birthday of this country that I love with all my heart – that in order to protect it, (if need be) I’m willing to die on the battlefield – I will endeavour to justify my utmost support for the government: not with political arguments but with day-to-day experiences. To begin, I confess that I used to be a naïve – critics call it “brainwashed” – supporter of the PAP. I would volunteer at the local Meet-the-People Session religiously every week. I would read the news and take the ministers’ words as it is. I would aggressively defend against irrationalised opinions of government policies. I chose to study Politics with a great intent to understand the psyche of politicians, to be well equipped to combat any accusations of the government that were poorly thought of. I completed my freshmen year as a Politics and International Relations undergraduate in the United Kingdom (University of Manchester). What I learnt in university turned out to be different from what I had expected. Instead of reinforcing my beliefs, it made me more critical. Liberal democracy, checks and balances, free press, freedom of speech… The more I studied, the more I realised how my government was under the attack of the prodemocrats. However, at the same time, something else seemed to be invigorating my allegiance to the Singapore government. It wasn’t what I was learning in university. 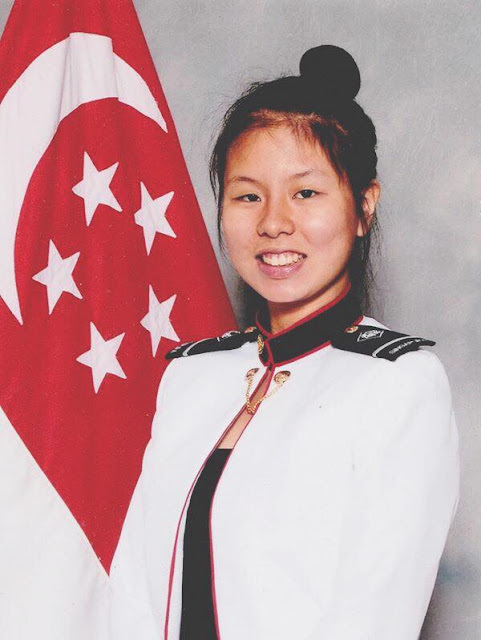 It was my everyday experiences – the long walks down the streets of Manchester, the trips to the Underground Tube in London, and the interaction with friends from all around the world – that bolstered my faith in how Singapore is being run, and my sense of pride to be called a Singaporean. I walked to college and back every day, saddened by the sight of homeless men and women begging for spare change. I visited the city center every weekend to immerse myself in the vibrant city life, only to be tainted by the ugly streets plastered with splotches of unwanted gum. I tried my best to go home before the sun went down; otherwise, I would be jumping at every alarming sound that could possibly have been a gunshot or a violent attack. I ran to the bus stop on Sunday mornings, hoping and praying that I didn’t missed the bus (for I would never know when the next one would come). I walked to the nearby Underground Tube when I was in London for the weekend, half expecting the station not to be operating on that day. I learnt about the concerns of my peers in finding a job back in their home country upon graduation. I heard about their plans of not returning to their country, in search of better prospects elsewhere. 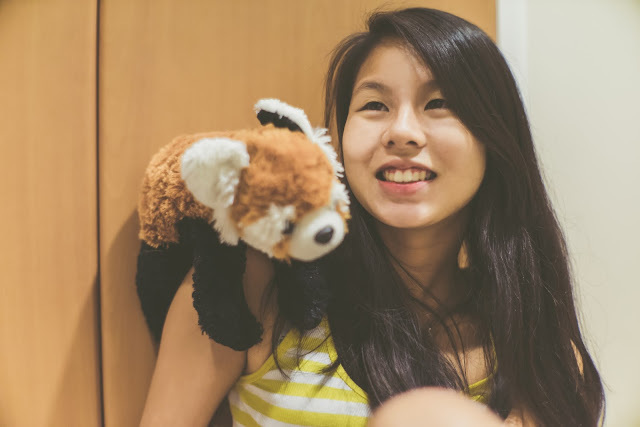 All of these are things I would rarely – if not, never – experience in Singapore. And on one of the occasions when I sought the opinion of a European friend of mine on Singapore’s lack of freedom of expression, his reply took me by surprise. “Who cares? You have money.” His reply brought things into perspective. I’m not saying (and I believe that’s not what he meant) that such freedoms aren’t important. What I’m saying, reader, is that compared to the people living in many other countries, in fact even in most of the 1st world countries, we are very fortunate to be living in Singapore. Before the anything-but-PAP supporters rebut with their arguments on how we – the average citizen - “technically” don’t have money, or that money isn’t everything, I would like to remind them that despite how financially handicapped you are, you still have the freedom to food security and personal safety that more than a handful of Europeans do not even have. My point is simply: do not take it for granted. On the 23rd of March this year at about 9p.m., I was on a trip to London, waiting for my scrumptious dinner to be served at the very sought-after Burger and Lobster. While waiting for my platter of steamed lobster to appear in front of me, I was scrolling through Facebook. That was when I first caught sight of PM Lee’s official statement on the passing of former MM Lee Kuan Yew. My first instinct told me that his Facebook account was probably hacked, again. Denial. It was only after confirming with the various sources that I finally came to terms with reality. I, along with my fellow Singaporean friends who were on holiday with me, continued dining as though nothing had happened. Yet, deep inside, we all knew that something had changed. There was an extremely unsettling feeling within me – a subtle amalgamation of grief and anxiety. I was tempted to pour out my feelings in a blog post a few days after his death; to lament the death our dearest founding father, to vent my anger at those who were disrespectful, to express the innumerous worries that I was harbouring for the future of Singapore. However, I abstained from doing so in order not to pass off as non-objective and emotional. 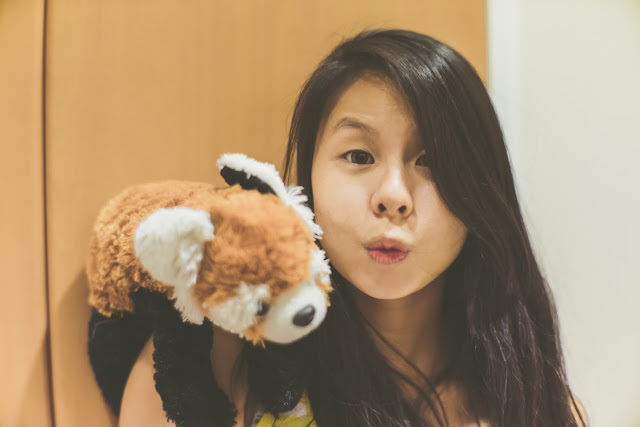 Today, more than 4 months after the death of Mr. Lee Kuan Yew, I vindicate the anxiety that I had harboured and I restore the right to write this blog post. The general elections are coming. There are speculations that it would be in September. If that is the case, I wouldn’t get to vote – I would be a month late. Yet, I hope that through this post, I would convince at least one person to consider where Singapore is right now, in the light of what is happening in the world – what is happening to our neighbours, what is happening to our former colonial authorities, what is happening to the supposed 1st world. In the light of all these, there is a reason to be grateful to our government. There is a reason to rejoice for your birth in this blessed nation. There is a reason to stay and fight for the country amidst its challenges. I do not want to sound over-optimistic. There are a myriad of issues and policies that I have started to question ever since I have been exposed to liberal democracy outside the country. I hate the inequality; my family struggled for more than a year with the meager earnings of my father’s small business. I do not believe in gerrymandering; I reckon that a capable party should compete based on fair elections. I don’t think that ministers should be paid so much; a genuine servant of the country ought not to be motivated by money. I disagree with certain aspects of how the public service is being run; more than 2 years in the Armed Forces has showed me more than enough flaws to convince me of the inefficiencies of the public service. Yet, unlike many who turn these frustrations into blind hatred for the government, I choose to accept that no government is perfect. I’m no longer pro-PAP. I’m pro-Singapore. I love my country and I would support the party that proves its mettle and worth. For taking care of my country for the past 50 years and nurturing her to whom she is today, I’m grateful to the PAP. However, if there comes a day when the country is being wrecked in the hands of this party that I have placed my trust in, I will not hold back my vote for the opposition, if there be a more capable one. 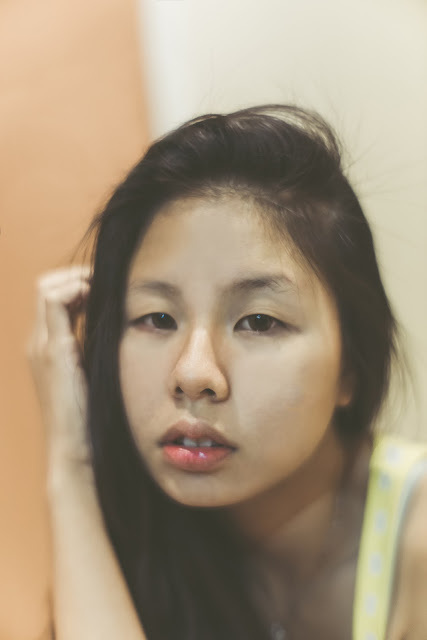 And on a final note, to the Singaporeans who claim that they hate the country (especially because of the huge influx of foreigners) and are eager to leave for another country: by doing so, you are a hypocrite and you are no different from the foreigners in our country that you so very hate. You are not welcomed in another country either. I used to be extremely embarrassed about shaking hands. I was born with eczema. My hands (in fact, my whole body) were dry and coarse. Thanks to Schülke, I am now able to confidently embrace handshakes and physical contact! 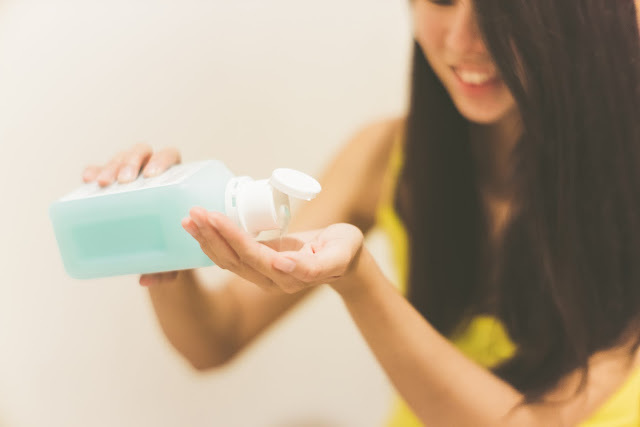 Because of my persistent skin condition, doctors would advise me not to use shower gels with high soap and fragrance content. Why? They deplete our skin's oil. 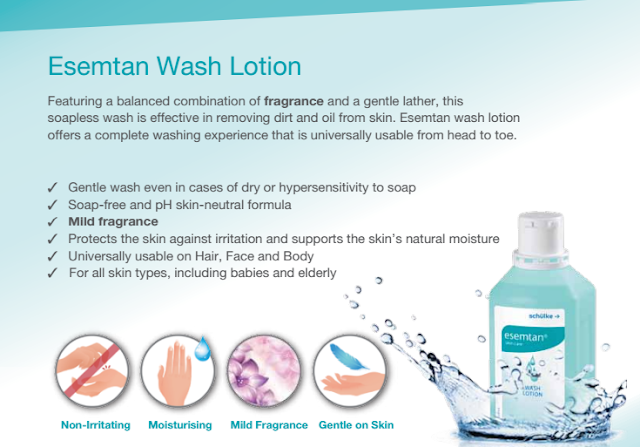 Esemtan wash lotion is soap-free and mild in fragrance. Yet, they work in the exact same way as soapy shower gels! 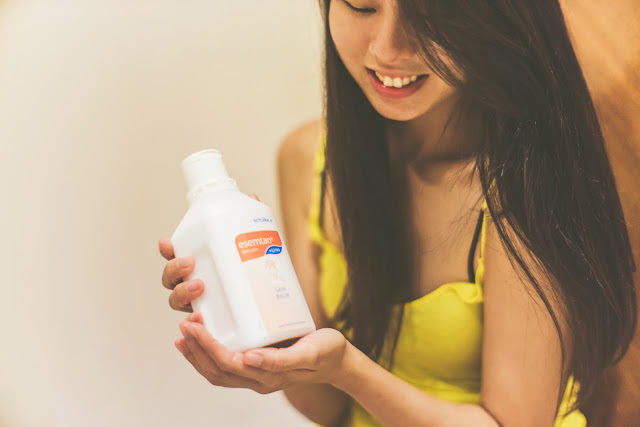 This enables me to be clean and fresh after washing up while maintaining my skin's natural moisture. On top of the wash lotion, the Esemtan skin balm can be used to complete your daily moisturising routine. For those who know me well enough, they are aware of how much I scratch and scratch and scratch all the time. 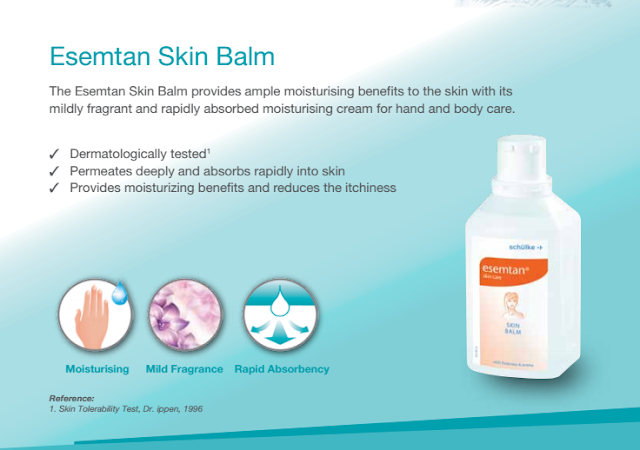 Esemtan skin balm works like magic in reducing itchiness and its effects are pretty immediate! 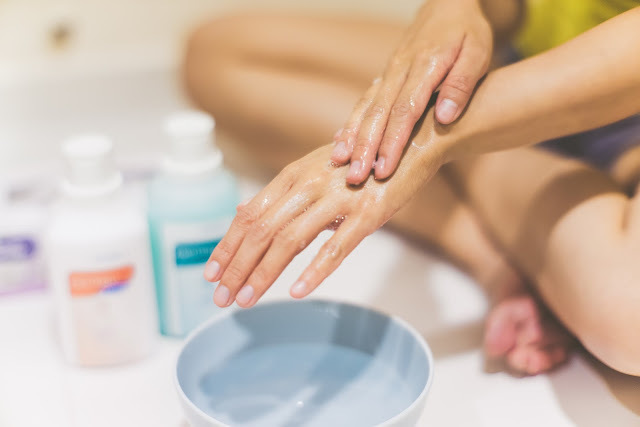 Here's a peek into my daily hand moisturising routine with my new Esemtan products! 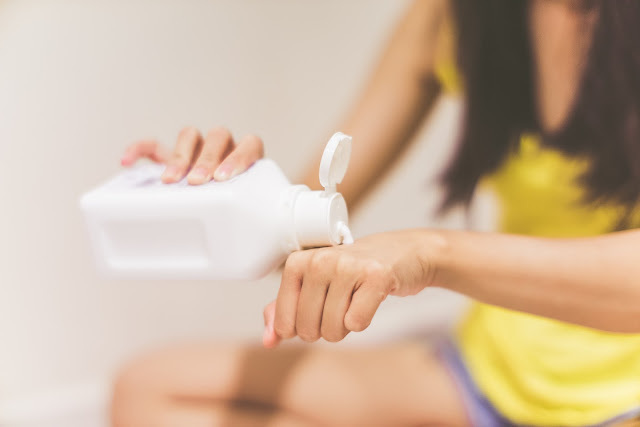 I would first begin by pouring approximately 2-3ml of Esemtan wash lotion onto my palm. Then, I would froth it by adding some water. I would spread the lotion to both hands and wash thoroughly. And finally, rinse it off and dry it with soft tissue. Next up would be the Esemtan skin balm. I would apply about a coin-size amount onto the back of my palm. I would then rub it gently and spread it to the rest of my hands. Join me in my diligent moisturising routine today! 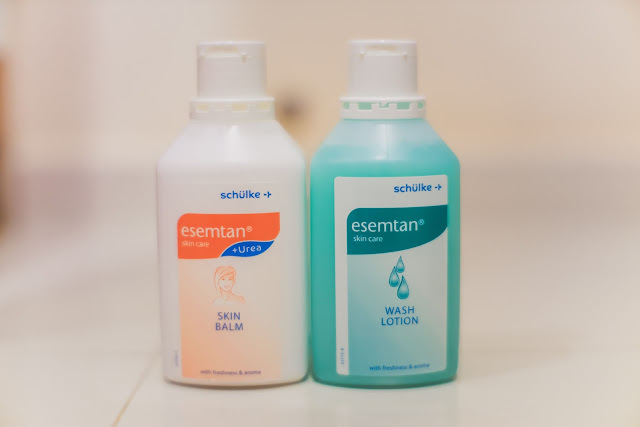 You can find the Esemtan wash lotion (S$19.75/500ml, S$35.30/1L) and the skin balm (S$20/500ml) at NHG, Guardian, Unity, Watsons or any independent pharmacy (e.g. Pink Beauty & Beauty Essential).